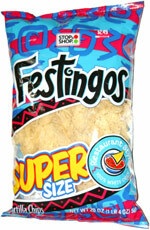 Taste test: These large, quarter-circle shaped tortilla chips were OK.
With a fancy name like Festingos, I expected some sort of special flavoring, but they were just plain white corn tortilla chips. The chips were crisp with a brittle crunch and a good taste. Most of the chips didn't have much curve to them, so they were just OK for dipping into salsa. Plenty of surface area, but not much a scoop-like shape to hold the salsa. Smell test: Strong salted corn tortilla chips smell. This snack was discovered by Jim O'Brien (but not the basketball coach) at Stop & Shop. Review published .